Over breakfast this morning, we discussed a few ideas for the next growing season. It’ll be here sooner than we think. First, we’ll move the peas and beans to the fence. We have two trellises now and rather than let one lie fallow (as we did this past season), we’ll plant one trellis with cucumbers and the other with legumes. 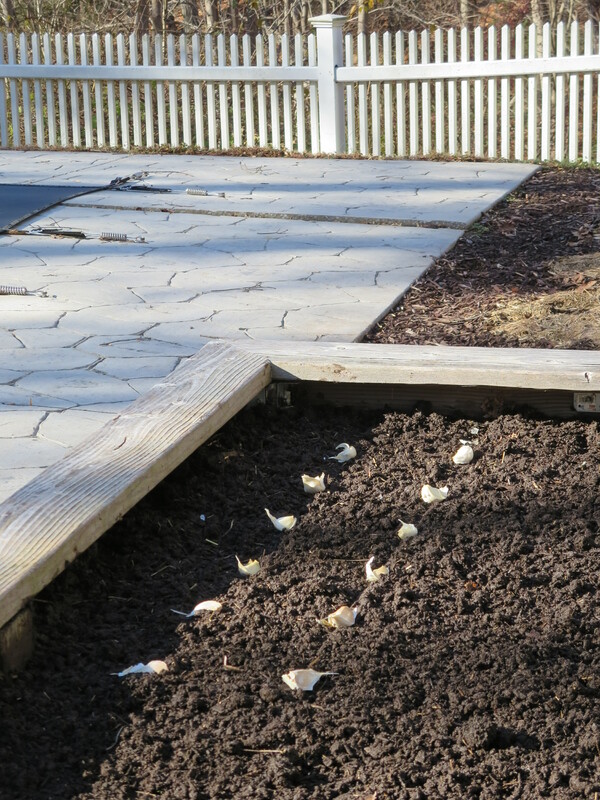 We sow the peas and beans directly into the ground (as opposed to starting them inside, as we do the cucumbers) and I am pretty sure that there will be enough sun to germinate the seeds. 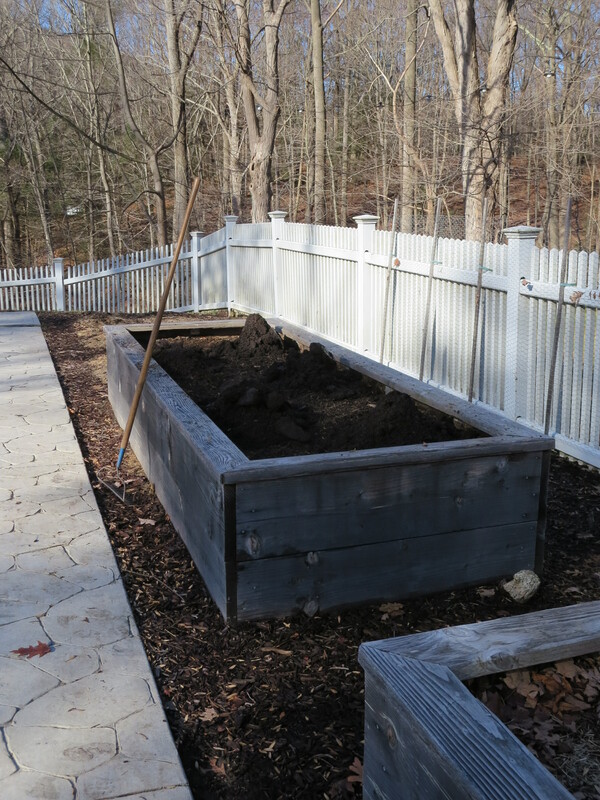 Second, we’ll plant the tomatoes in the ground only, not in a raised bed. 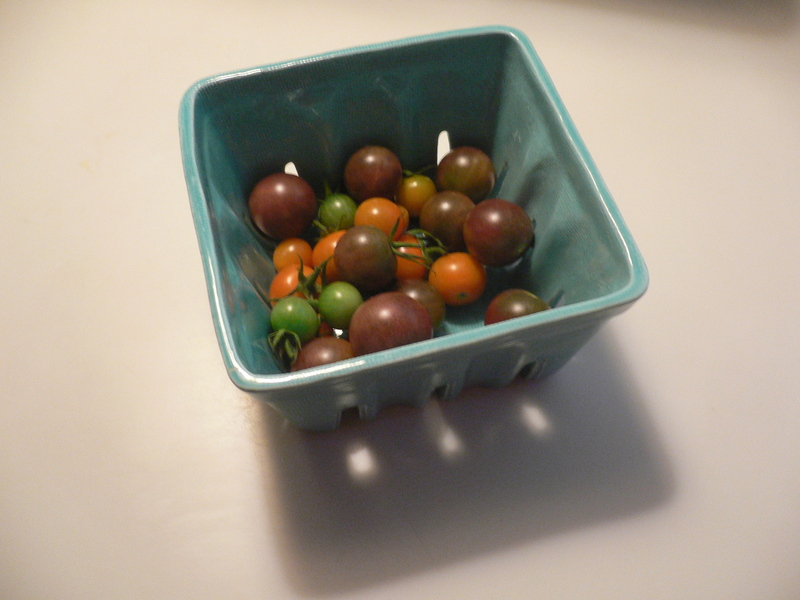 I’m a bit surprised that we came to this conclusion because I was sure that the tomatoes in the planter would do better than those in the ground, mainly due to the soil being older and more conditioned in the planters (see June 8, 2014, part 2). Perhaps it was Murphy’s Law or maybe our tomatoes were contrarian by nature, but the vines in the ground grew fuller and produced more fruit. Go figure. 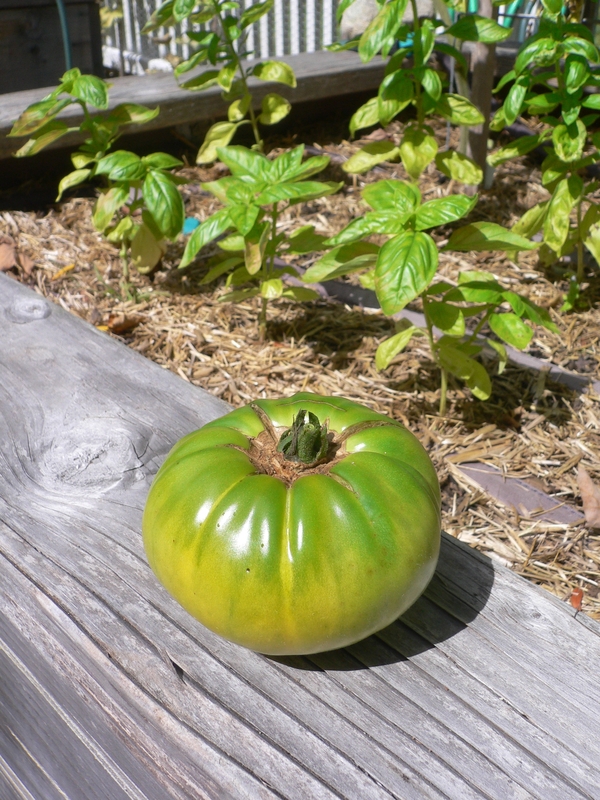 Planting only in the ground will mean fewer tomato plants—and, possibly, fewer tomatoes—but each plant will have more space. 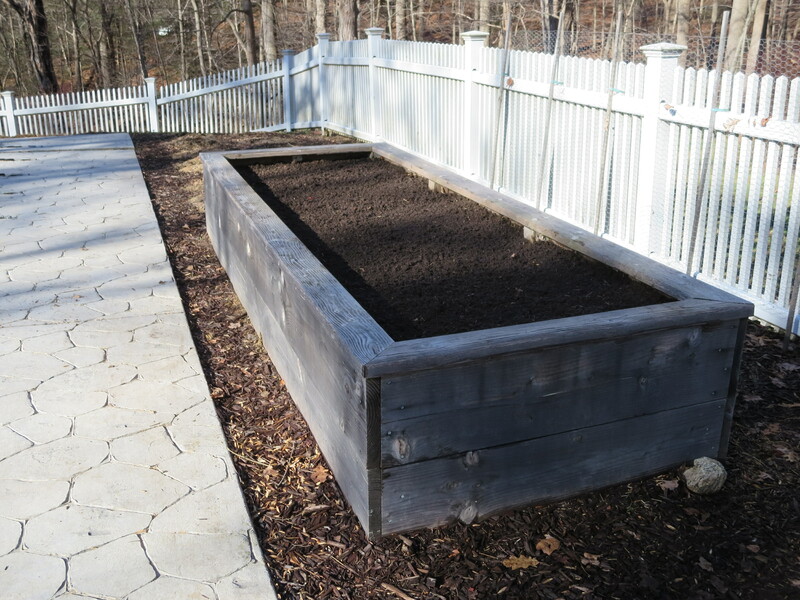 And because there will be no tomato plants in the raised beds, we’ll also have more room there to plant other things. 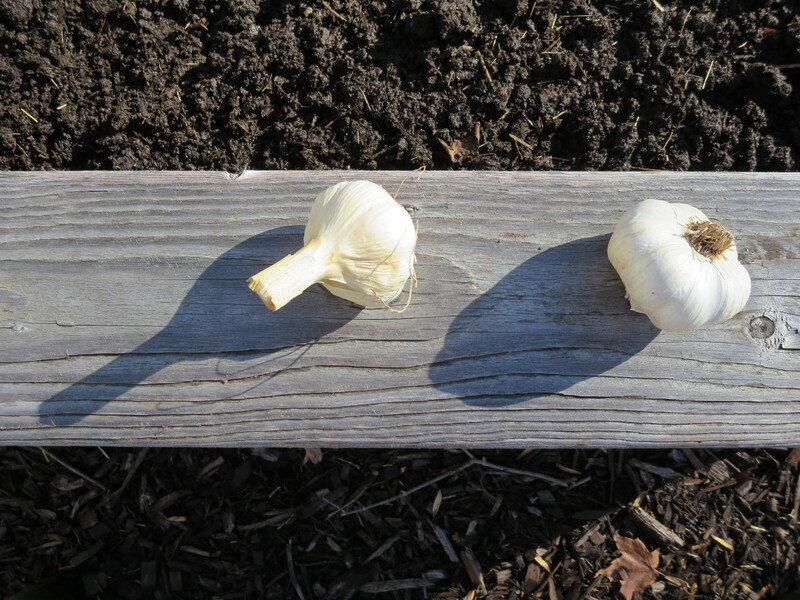 Which leads me to the third idea for next season: garlic. And now is not too soon to be thinking about it. 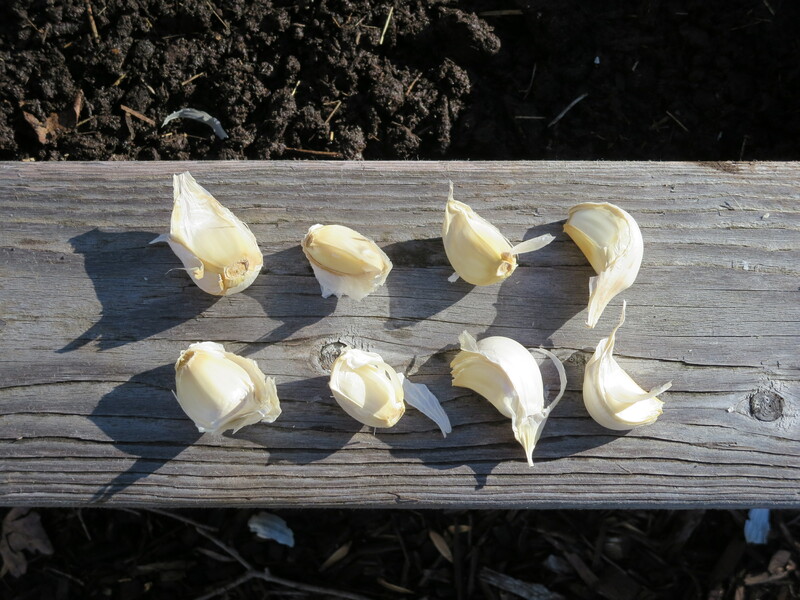 Jay mentioned that he always waits until it is cold enough to make his fingers hurt to plant the garlic (and his garlic is always beautiful so he must be on to something). 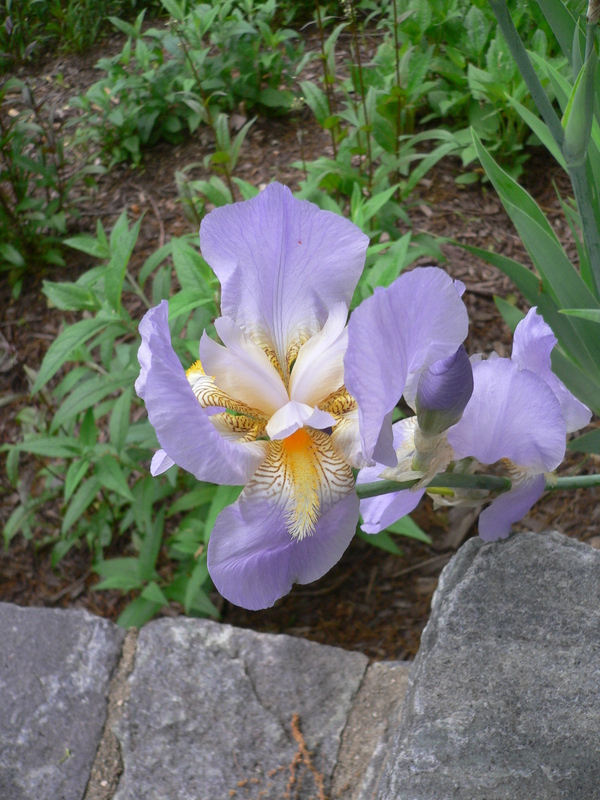 Today fits the bill, weather-wise, and I went out to plant. 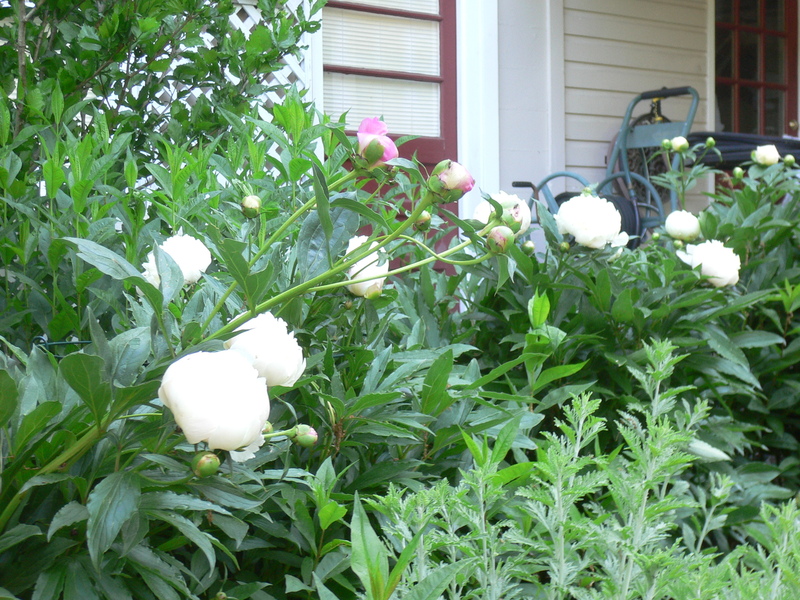 I first had to prepare a spot for it in the southwest corner of the west planter. 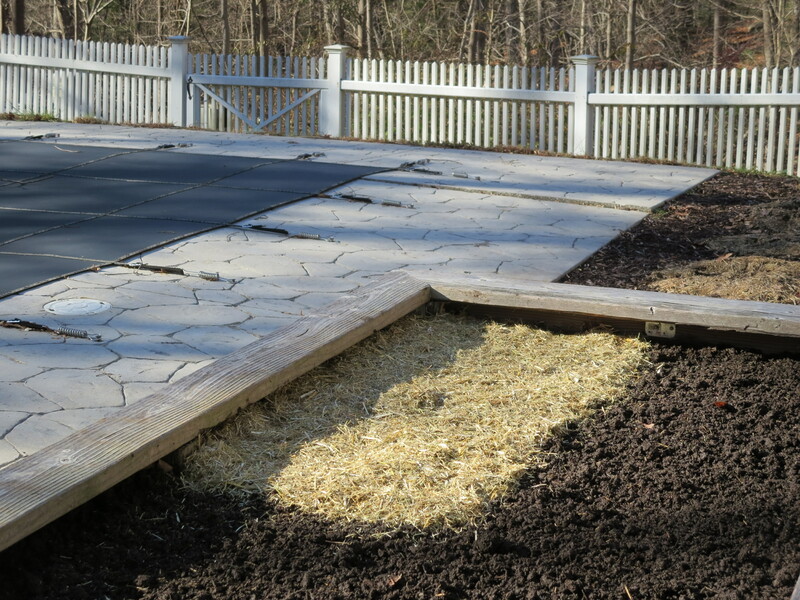 I cleaned up the old mulch and fallen leaves, pulled a few weeds, added a topping of fresh compost, and raked it smooth. 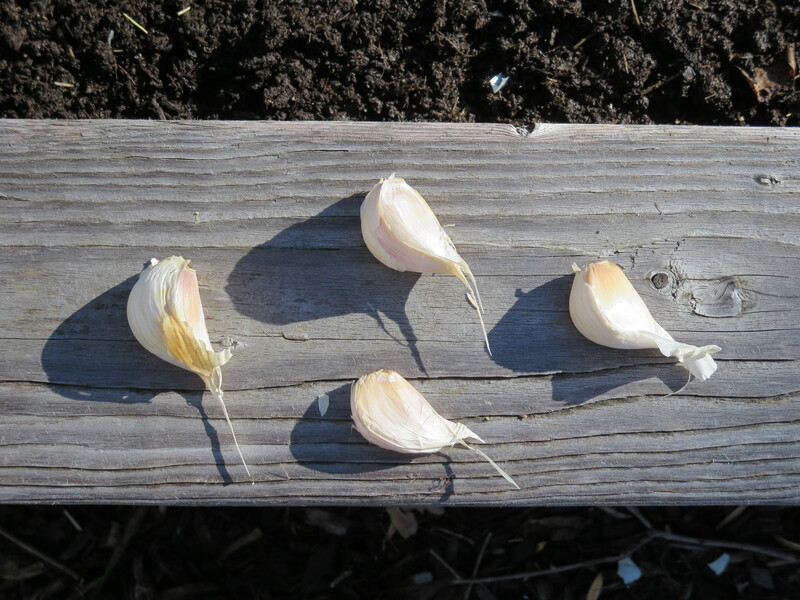 I broke up the heads of garlic and picked the best cloves of each type. Perhaps we waited a bit too long; some of the cloves were starting to dry out. Still, I was able to get eight soft neck and four hard neck cloves and dropped them in one-inch-deep holes (root end down, pointy end up). I covered the area with fresh mulch and gave it a good watering. 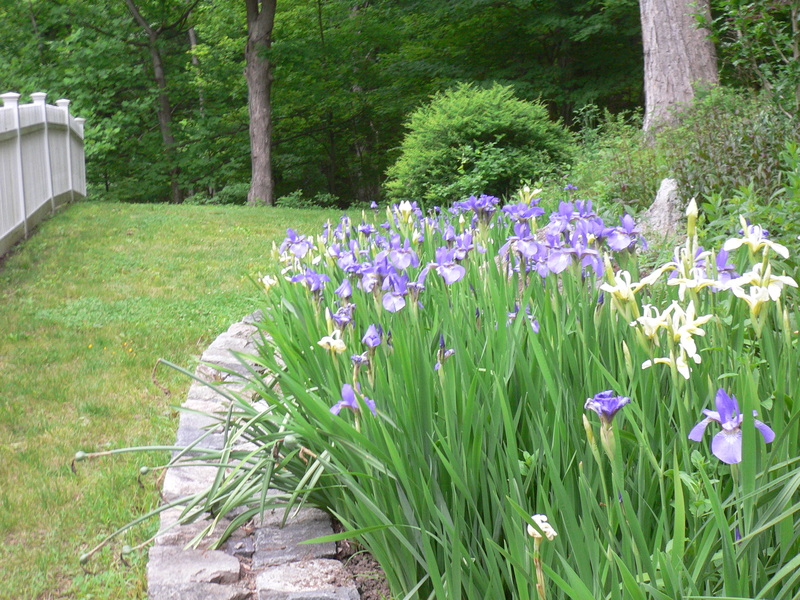 If all goes well, we should see sprouts (also called scapes) in early spring. It turns out that when I was describing the benefits of crop rotation two weeks ago (see May 4, 2014), I was only half right. 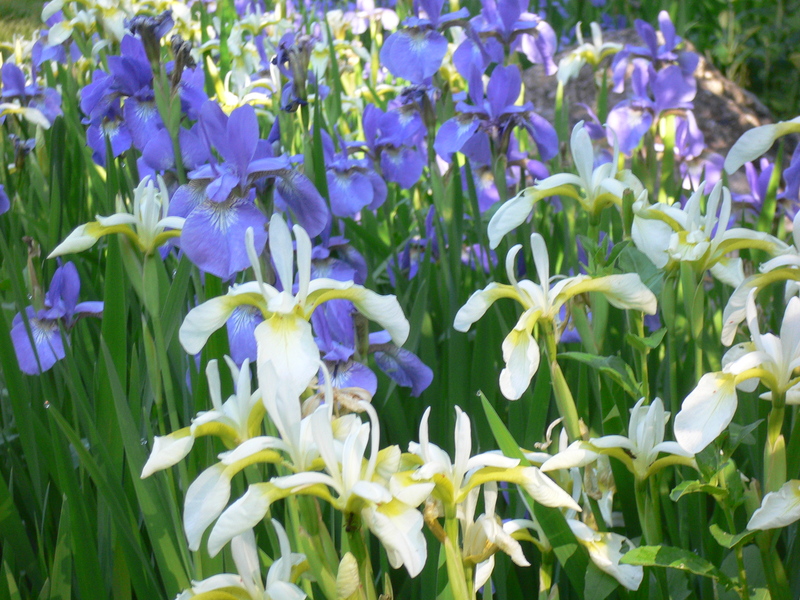 The process can be much more complicated—and substantially more advantageous—than merely planting different families of plants in different plots each season. The key is choosing what to plant and the order in which to plant it. 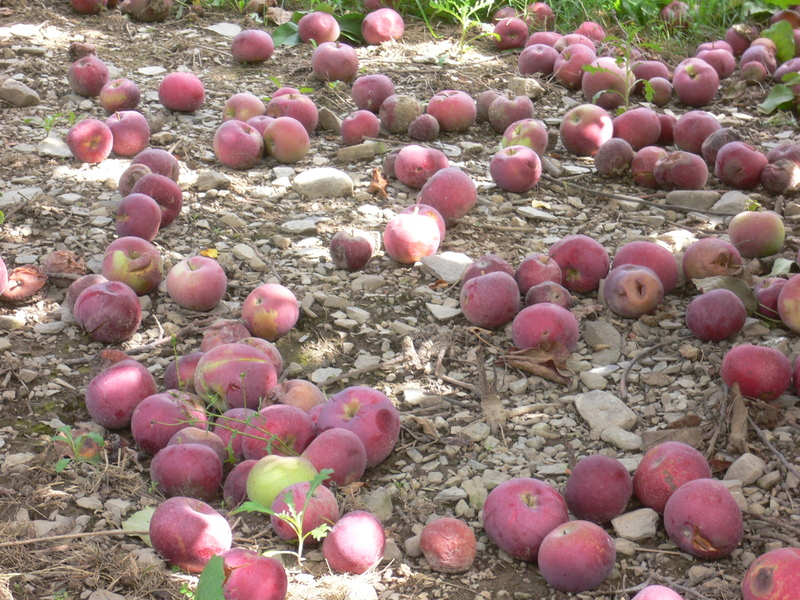 A good example of a more scientific approach to crop rotation is described in an Op-Ed piece by Dan Barber, chef of the restaurants Blue Hill (in New York City) and Blue Hill at Stone Barns (in Pocantico Hills, New York), that appears in today’s New York Times (see “What Farm-to-Table Got Wrong”). Chef Barber buys his wheat from a farmer in upstate New York. On a visit to the farm, he learned that the wheat is only planted at the end of a four-year cycle of carefully selected crops, each of which performs a specific task for conditioning the soil. The procession follows a basic order which can be modified as soil response and weather patterns dictate. First up is a cover crop such as mustard, which cleanses the soil and adds nutrients. Next is a legume to fix Nitrogen. Rye follows which, apparently, crowds out weeds (and also “builds soil structure”, although no explanation is given as to what exactly this means). Last to be planted is the wheat, the crop that outsiders (and until recently, Chef Barber) would think of as the whole point of this enterprise. What is lamentable in the wheat farmer’s case is that the market for what those outsiders might call the off-season crops—the mustard, peas and rye—is scarce. While the wheat commands high, New York City prices, the other vegetables and grains go unwanted and often end up as feed for animals raised as food. Such use is not considered by most experts to be a very efficient use of resources. Chef’s response to this situation was to develop menu items at his restaurants that incorporate the lesser crops and thereby elevate their stature and, presumably, their price (I hope that he pays his farmer as much for the mustard, peas and rye as he does for the wheat). It’s an elegant solution—a no-brainer, in retrospect—and also a win-win. Really, it’s a win-win-win because not only do the farmer and the chef benefit but the patrons of Blue Hill get tasty meals out of it, too. So, how might this concept apply to the backyard gardener? Well, I’m not sure about growing an entire planter full of rye or mustard but half of a planter mixed with other like vegetables or grains might work (especially if Chef shares his recipes). And I never feel like we have enough Sugar Snap peas so the year of legumes would not be a problem. The primary issue is space, something we never seem to have enough of. Maybe the question for me is, where can I put two more planters? Just before shutting down my computer this evening, I took one last look at the weather forecast. Some people compulsively check the stock market and others keep close track of baseball (and other sports) scores. I’m addicted to the weather. I was rudely surprised to see that the National Weather Service had posted a Frost Advisory for later tonight and into tomorrow morning. Where did this come from? Yes, the forecast has been calling for cooler temperatures, with highs in the 70s and lows in the 40s and 50s, but frost? Really? And what am I supposed to do with this information, at such a late hour? The warning was not posted until about 6:00 pm. That gives me only an hour before the sun sets. I imagine that some farmers will be firing up their smudge pots tonight. A common sight in orchards and vineyards, these oil-burning heaters produce a high-volume of slow-rising smoke—some call it artificial smog—which I always thought enveloped the plants and slowed their cooling. 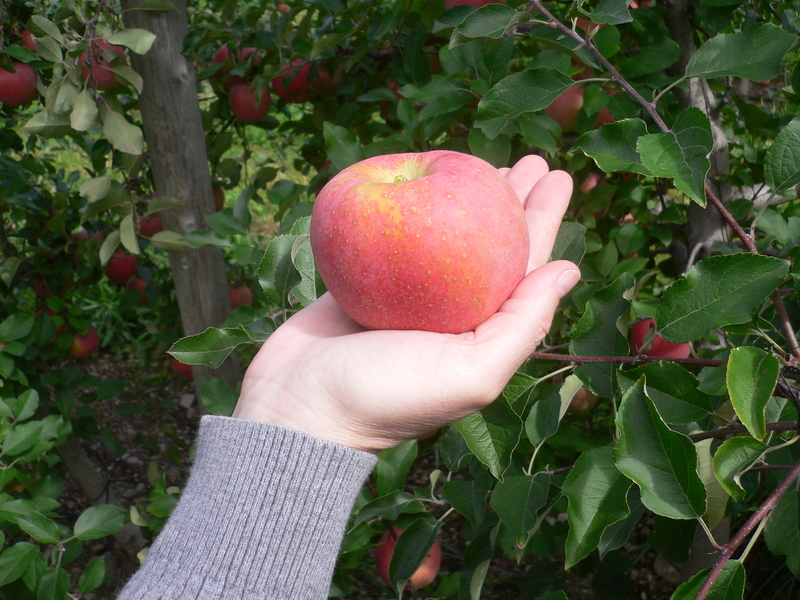 Turns out they work more like the large fans that other growers—such as an apple orchard we visited last weekend—will be switching on instead. Both the heaters and the fans circulate the lower levels of the atmosphere, moving colder air at the surface upwards and bringing down warmer air from the overlying inversion layer. I love the idea of having one of the monster fans in my backyard (I could connect it to my propane tank) but I suspect they are very expensive (no, I’m not seriously considering it). So this time, we’ll take our chances and do nothing. Despite the advisory, the forecast low is 44 degrees, well above freezing. I’m not too worried but we’ll see how things look in the morning. This year’s success story, in the early season at least, is the turnips. They have been happily and exuberantly growing, providing us with tasty bitter greens and piquant roots. Despite being crowded together, the roots have grown to diameters up to two inches. 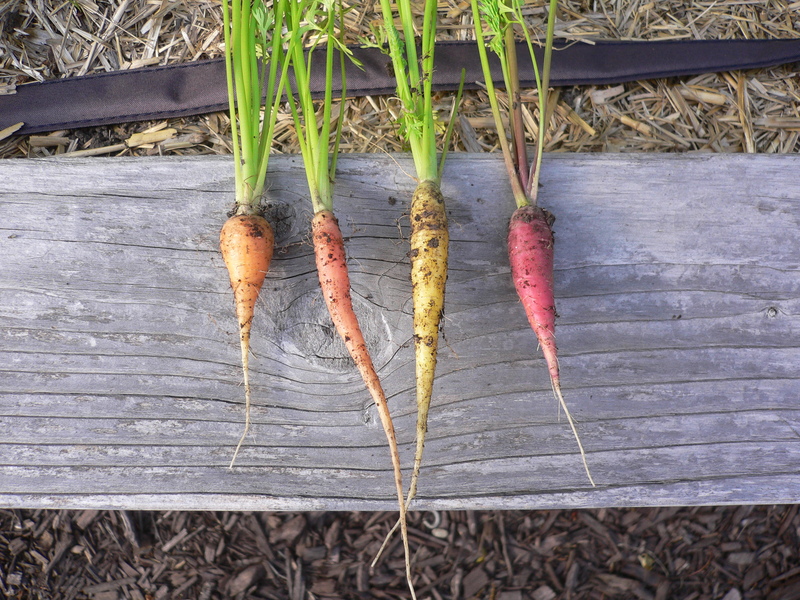 The radishes and carrots have been doing moderately well even if they are slower to develop than we would like. 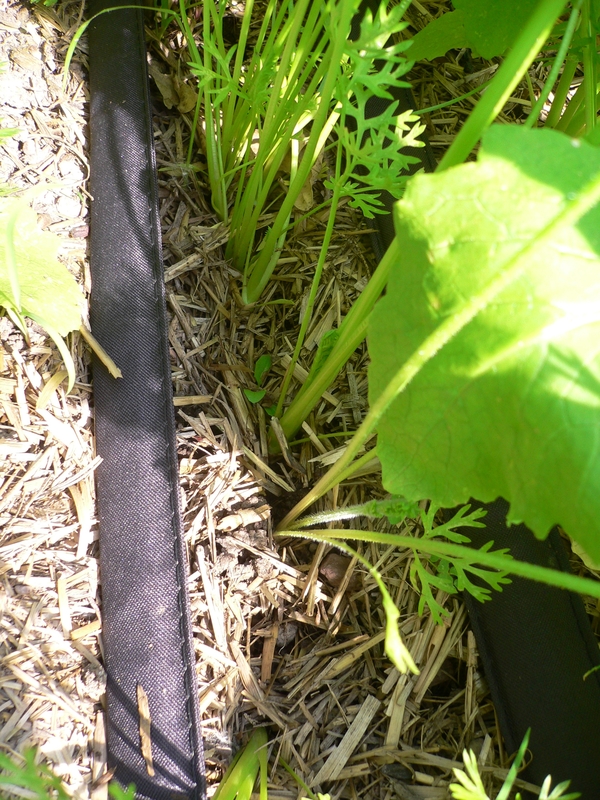 The first two rows of radishes are now mostly gone—eaten—but we are still working on the first row of carrots. So far, only a few have grown to what I would consider normal size. At the other end of the scale, the beets have not been performing well at all. 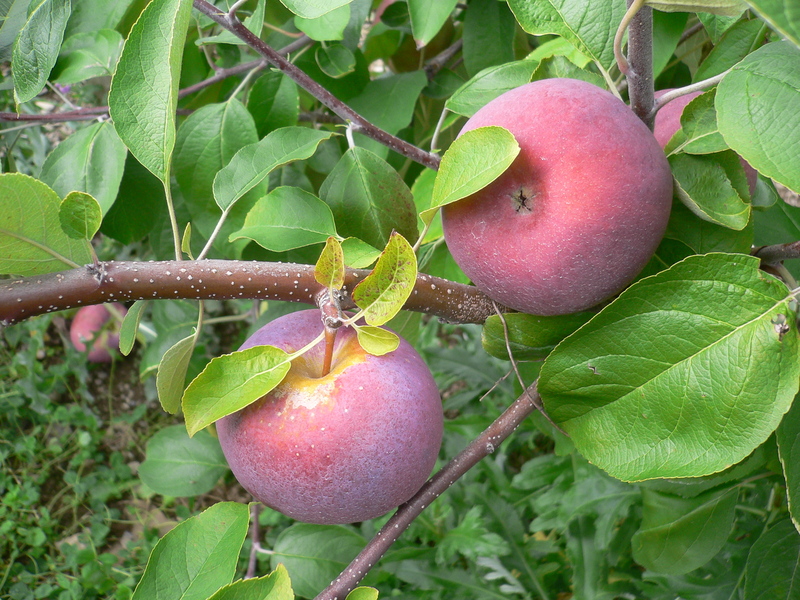 Even those seeded first—longer than two months ago—have not yet produced more than a few small leaves and there has been no enlargement of the roots. 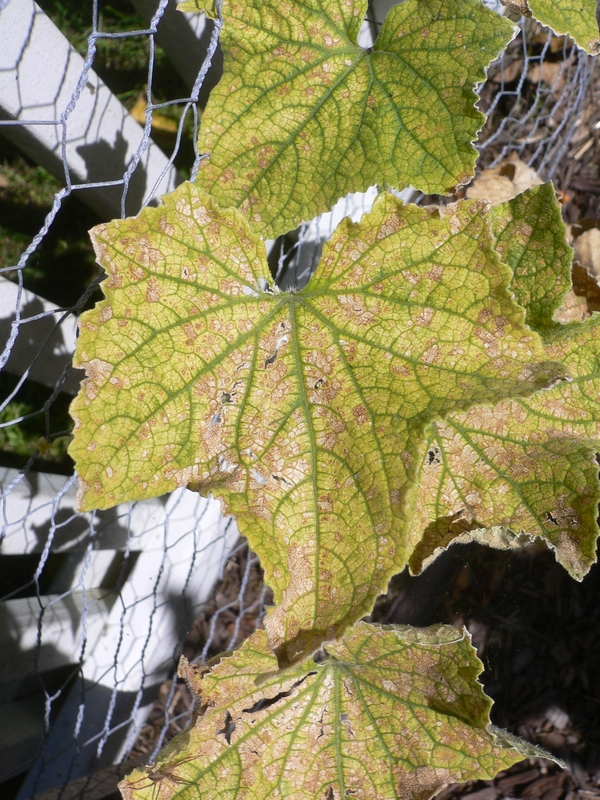 We have been fertilized them monthly but that hasn’t seemed to help. In fact, it might have hurt. Doing a little research online, I found that a likely reason the roots haven’t grown is that the beets’ environment is too rich in Nitrogen. This macronutrient is crucial for flowering plants and promotes the growth of the greens. And because a plant has only so much energy available to it, what has gone into the leaves has not been available for root development. 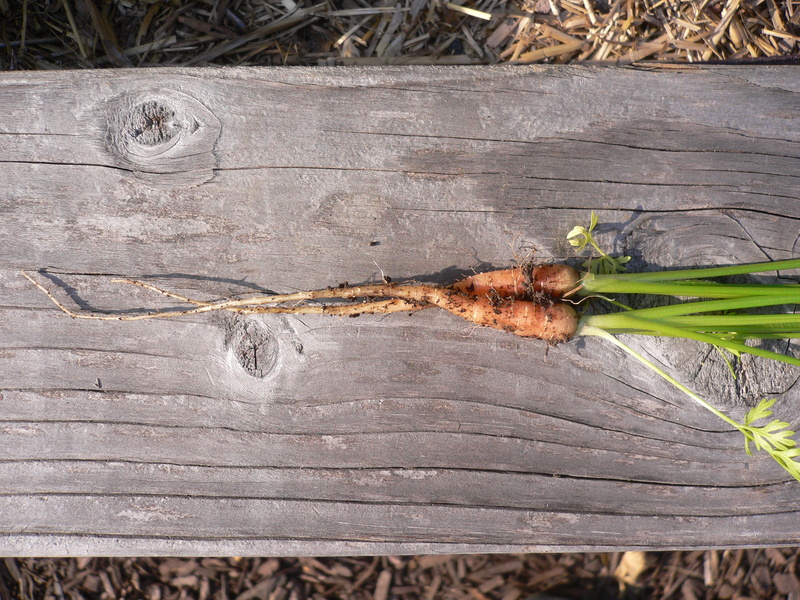 That might also explain the slow growth of the radishes and carrots, both of which have towering greens but small roots. 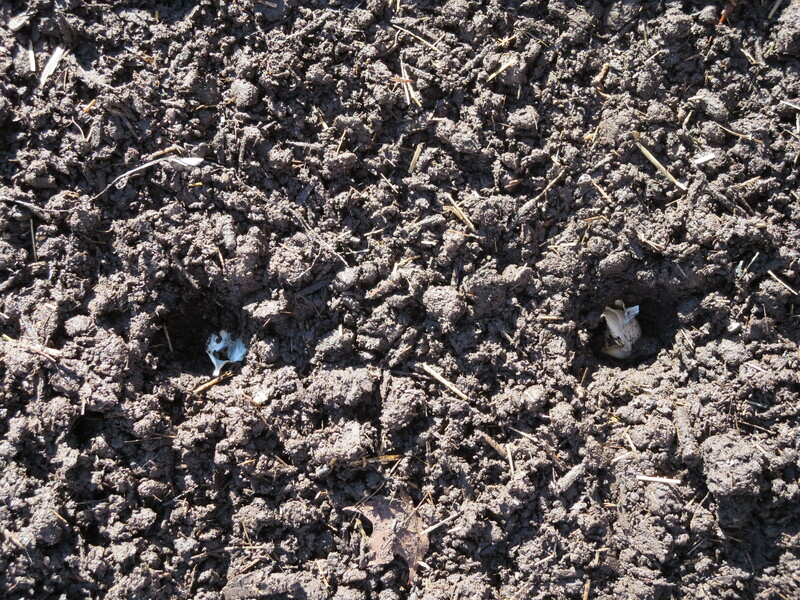 Also, some of the radishes have bolted (gone to flower) which makes sense in a Nitrogen-rich environment. Talking to our farmer friend, Jay, at the market this morning, we learned further that thinning might be even more critical than we thought. 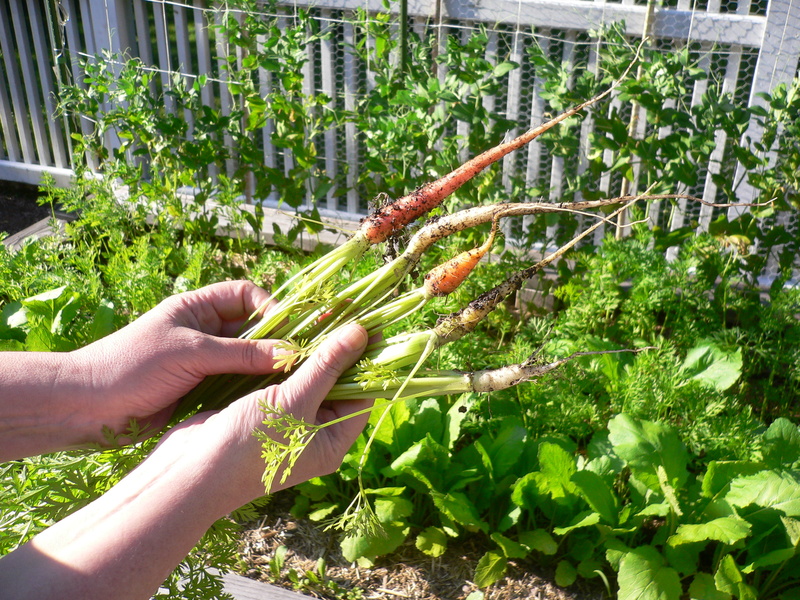 We’ve been diligently thinning the radishes and turnips, motivated by our predilection for the greens in salads or sautéed as a side dish, but have been less attentive to the carrots. Their greens are less attractive as a vegetable in their own right. 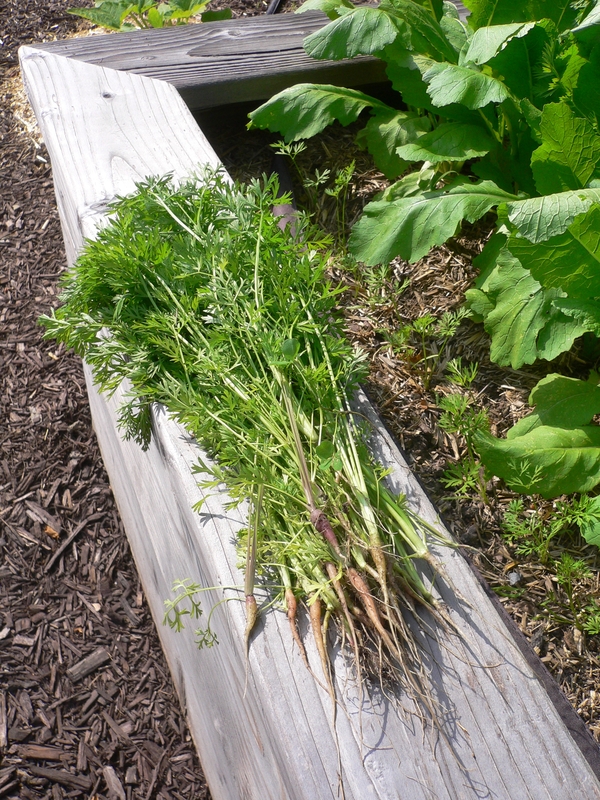 And I discovered that I had seriously neglected the second row of carrots. 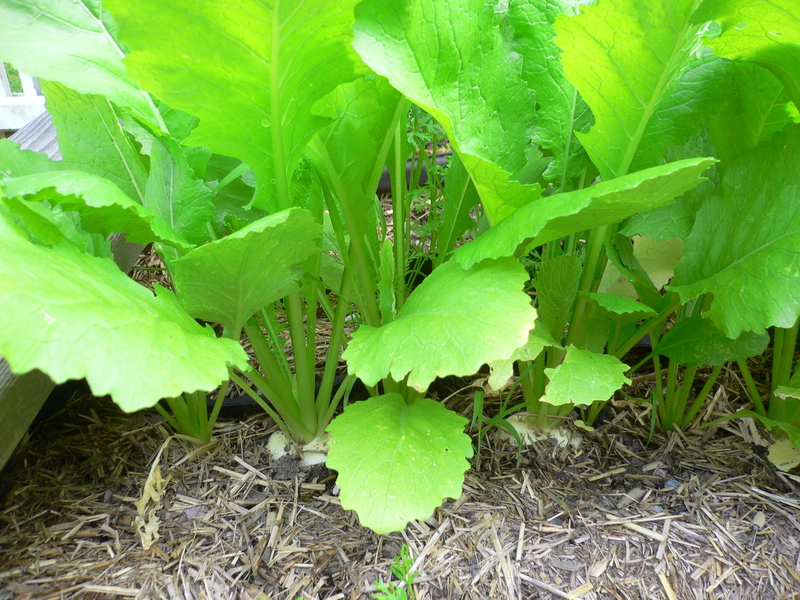 It is sandwiched by two rows of turnips whose bushy greens almost completely obscure them. I’m not sure I have ever thinned this row and spent a half-hour this afternoon catching up. Jay also told us that beet seeds are actually seed clusters. This means that even if they are carefully sown with ample space between them, thinning will still be necessary if and when all of the individual seeds germinate. There’s no getting around it.